KINGDADS: Carrots/Cream Cheese/Olives are fun for kids? Carrots/Cream Cheese/Olives are fun for kids? I overslept this morning and given how slowly I'm getting moving this morning I realize that I need to get to bed early tonight for some more rest. However, checking email this morning and I notice that I received an email from one of the fathers group I follow. 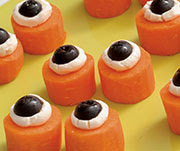 This email is touting a fun Halloween ideas and treats for your kids. More ideas are good, right? Of course, but then I read it and think immediately who exactly is their target audience?. Are they promoting ideas for kids actually living on planet earth? Who are these people? Wow, I really must not be awake. I guess the thought behind this email is that kids eat too much candy and generally unhealthy foods during Halloween so get in some healthy food. Good idea and noble cause, but it leaves me wondering if some are losing the point of childhood. Being a kid is fun, it's supposed to be fun. Eating candy at Halloween until you're sick is a right of passage for kids. Granted I think my kids would get sick eating carrots topped with cream cheese and an olive, so I am on the same page as the creators of the email. Maybe the point of this one is how to teach your kids to get ticked off at you and pull Halloween pranks?. Halloween is not about nutrition and I don't think it should be. Halloween is a change from the normal day to day and is a time to get sick eating candy. Parents should be eating more candy with their kids and just enjoy the escape from the all too often daily nutrition battles. Besides do you really want to convince your kids to drop that candy bar for carrots? My kids will be eating all the candy they can muster on Halloween day and then like every year in the past, any remaining candy will be discarded following day. Enjoy Halloween day and just have fun being with you kids. During Halloween children eat lots of candy and unhealthy treats, so sneak these fun and healthy treats in for your children's Halloween festivities. Cut the carrots into 1 inch chunks. Top each carrot with a small amount of cream cheese and then place an olive in the middle of the cream cheese.